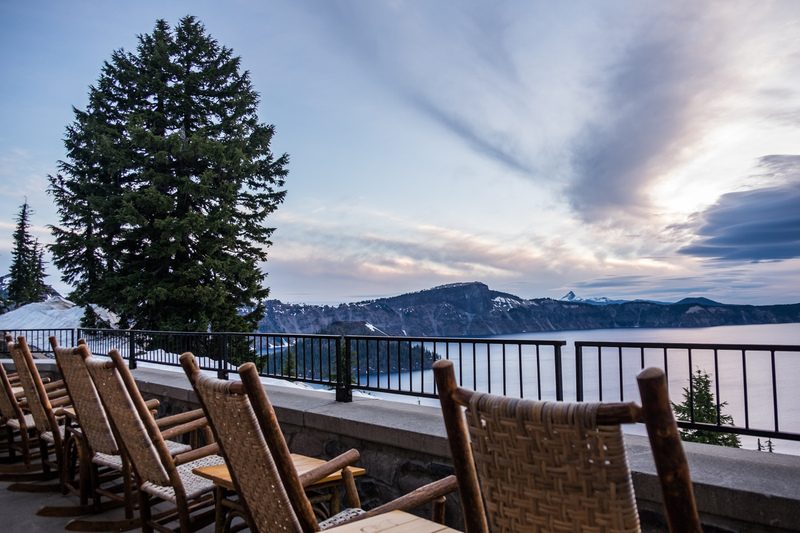 A select few of the historic national park lodges in America retain the old-time feeling that existed during the days of John Muir and Teddy Roosevelt -- one of the few is the Crater Lake Lodge in southern Oregon. 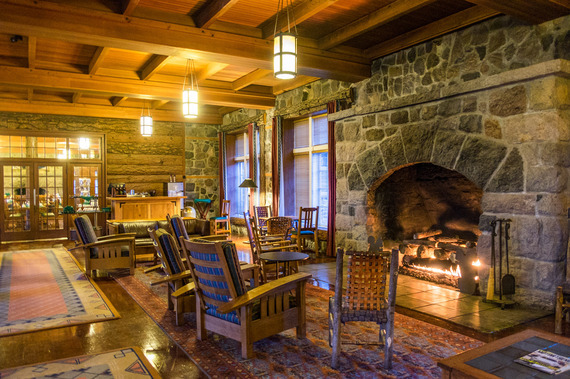 Built in 1915, it is one hundred and one years old--one year older than the National Park Service is--and it set the standard early on for what all future park lodges should strive to uphold in terms of character. Glimpse for a moment in your imagination what you think a park lodge experience might have looked like at the turn of the 20th century when Crater Lake National Park (the 5th park to be established) was formed and whatever is in your mind, that's this place! Well-to-do men and women wanting an adventure and to stay cozy by a fire with drink in hand still occupy the grounds today...just add neoprene zip-ups and iThings tethered to the hand. Times have changed, as have the souls, but it's basically the same deal: accommodations that bring the outside in - the quintessence of a national park lodge. The entrance pretty well takes your breath away with indigenous trees rising from the floor and rising through the roof of the lobby. In the next room, the Great Hall, a massive stone fireplace crackles warmth into the cozy parlor with sitting areas grouped together as though people are meant to sit together and - gasp - converse. 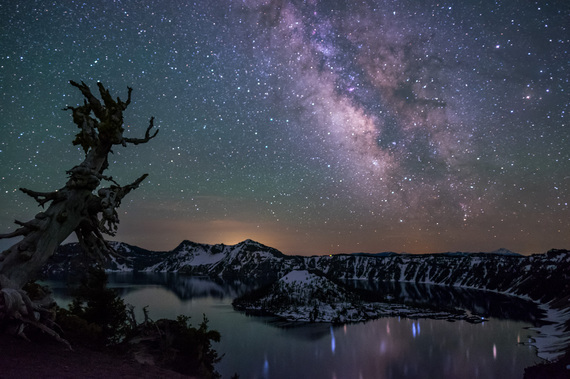 Aside all of that, it is the kind of place that you want to wrap up in a cozy sweater and read a book, play a game, or edit and create National Park content while drinking Oregon wine and craft beer. Good luck wanting to leave, right? Not after you get a load of the lodge's most impressive feature, the outside deck off of the Great Hall, where rocking chairs overlook the 7-700-year-old collapsed volcano turned lake (called a caldera) holding 4.6 trillion gallons of water. It is extremely still and reflective and impossibly blue. To walk onto the back patio for the first time is sublime. Almost even more wonderful is hearing others' reactions when they walk out for the first time - the oohs and aahs and "oh my Gods!" - it is one of the finest views anywhere in the world and to be able to see it just steps from your room is simply amazing in this day and age. 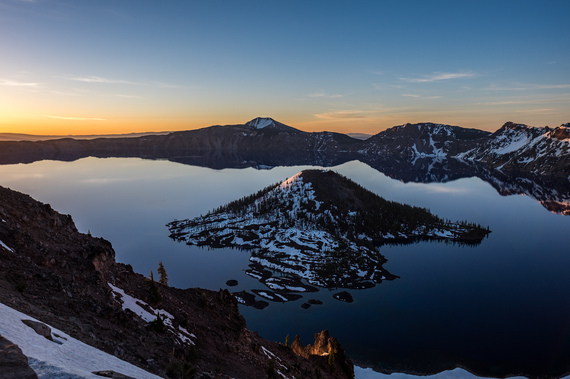 The peak season for this park is summer (June-October) when you can get onto the lake, explore areas with lake access, drive the full length of Rim Drive, and hike out on passes that aren't rendered impassable by slushy melting snow. Even during the summer season you might meet up with some snow as a result of the high altitude (6,178 feet.) During the winter, exploring the area by snow machine, on skis, or on a secluded backcountry hike is pretty much the only way to get into the park and we can only imagine how breathtaking it would be in such a silent state. Regardless of when you plan to visit, look thoughtfully at the official Crater Lake National Park website prior to planning so that you know what areas will be open and ready to greet you upon arrival. Happy trails!